HaLong Investment and Development (BIM Group) is a limited liability company, headquartered in Ha Long, Quang Ninh Province. The Group was founded by Mr. Doan Quoc Viet, an entrepreneur who had owned and operated hotels, restaurants and trading businesses in Poland prior to his returning to Vietnam. 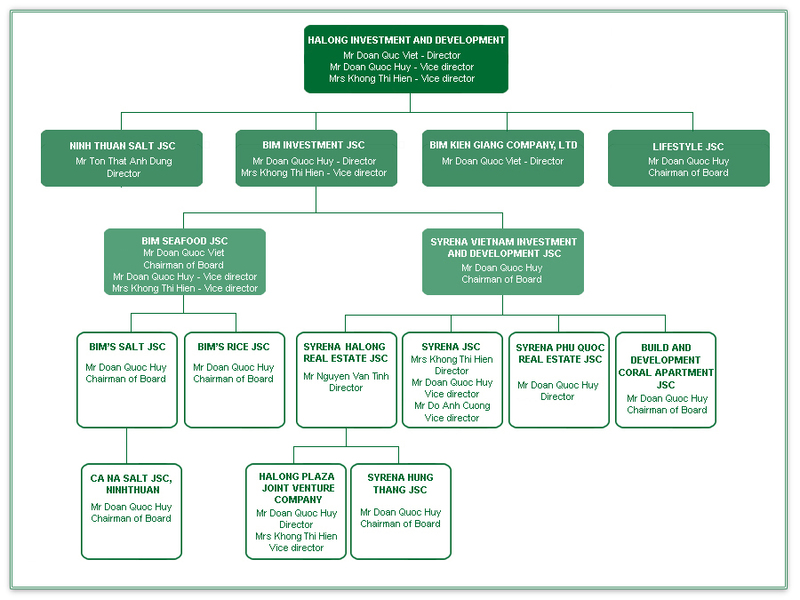 Today, BIM Group is one of the leading private investment companies in Vietnam. The company was established in 1994 as a developer behind HaLong Bay’s first international standard luxury hotel, the Halong Plaza. The success of Halong Plaza Hotel has set up a stable platform for the company to expand its investments is currently employees more than 3300 staff and is a leader in a number of industries in Vietnam such as Real Estate Development, Infrastructure Development, Services. Besides these businesses the Group is also involved in various other industries in other industries including healthcare, energy and trading. BIM is the big Group of many companies with different areas. BIM Kien Giang Company Ltd., - Established under Business Registration Certificate No 56.02.000226 for the first of registration on April 06th 2004. BIM Seafood JSC - Established under Business Registration Certificate No 5700662777 issued by Quang Ninh Investment and Planning Department for the first time of registration on July 3, 2007 with the first amendment dated on June 29, 2010. Ninh Thuan Salt JSC. - Established under Business Registration Certificate No 4500143821 issued by Ninh Thuan Investment and Planning Department for the first time of registration on April 26, 2006 with the forth amendment dated on February 5, 2010. Syrena Company Ltd., - Established under Investment Certificate No 011022000160 issued by Hanoi People’s Committee for the first time of certification on July 16, 2008 (re-registered under Investment License No 1037/GP dated on November 4, 1994, amendment licences No 1037/GPDC1 dated on May 30, 2000; 1037/GPDC2 dated on March 15, 2001 and 1037/GPDC3 dated on June 19, 2001).